The Perth is a unique and funky chain made of oxidised square elements, a great manly look! The Canberra is a chunky mens necklace chain in oxidised sterling silver, a great weighty feel! 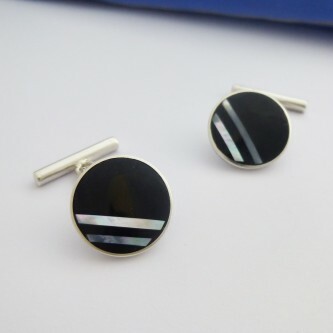 Rectangular mens cufflinks with a large Mother of Pearl strip set against jet black Onyx, stunning! Guilty Bangles are very excited to offer you a new and exclusive range of magnificent and unique bangles and bracelets in sterling silver for men! Our collection of men’s silver bracelets and bangles in 925 sterling silver are handmade here in the UK by an experienced silversmith, who crafts bangles to an exceptional quality. Guilty Bangles provide a stunning collection of men’s torque bangles in 925 sterling silver and all are hallmarked by a UK Assay Office. The collection is based upon the classic torque bangle adapted to a man’s wrist incorporating contemporary designs with an edgy twist. Guilty believes that there is a gents solid silver bangle in this collection to suit every man’s style, from the chilled surfer, to the sharp style of the city executive to the understated and quality feel for the classical gent. The classic men’s torque bangle bracelet design is the inspiration for our collection as we understand that a man’s hand size varies and to get a closed bangle over the hand can result in a poor fitting bangle on the wrist. The torque design offers flexibility in fit and a wider variation in the sharp and edgy designs that we can offer you. The range has now extended to include new bracelets for men including our new rope chain bracelets and necklaces and wheat chain bracelets as well as a small collection of cufflinks. Our new mens sterling silver rope chain is already proving popular and as always, our products are shipped with free delivery in the UK and through a secure collection giving ou peace of mind.